he role of White House secretary is one of the oldest in the history of the White House. Almost all Presidents have relied on personal aides or assistants to help them. The individuals who first filled this position were men, and many of the early White House secretaries were family members of the President. President Martin Van Buren's sons, Abraham and Martin, Jr., worked tirelessly for their father, and Millard Powers Fillmore, President Millard Fillmore's son, also served his father as secretary. The President's Personal Secretary must have excellent organizational skills and patience and must be willing to work long hours. Try to imagine a more stressful job than working outside the President's office each day  coordinating his many important phone calls and greeting official visitors, from champion athletes to public officials to heads of state! Betty Currie, President Clinton's Personal Secretary, works at her desk just outside the Oval Office. Betty Currie is President Clinton's Personal Secretary. She has occupied her desk outside the Oval Office throughout President Clinton's Administration, overseeing the President's daily appointments with visitors from across America and around the world. She greets all guests with a warm smile or a friendly handshake; she especially enjoys meeting all the children who come to meet and talk with the President. No two days are alike for Betty Currie. While at her desk, she handles many of the President's phone calls and assists him with his correspondence. She must also be ready at a moment's notice to leave with the President when he travels  dashing off in the Presidential motorcade or flying on Air Force One. Mrs. Currie holds a very special place in the heart of one of the members of the First Family  Socks! Socks is never far from Mrs. Currie's office, where he can curl up in his favorite chair or take a nap in the window overlooking the Rose Garden. 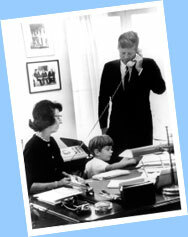 Evelyn Lincoln, President Kennedy's Personal Secretary, looks on while the President takes an important phone call and his son, John F. Kennedy, Jr., plays with her typewriter. introduced to heads of state from around the world. One of her most memorable encounters was with President Nelson Mandela of South Africa. About that meeting, Mrs. Currie remarks, "You know, he withstood so much and was not violent or vengeful, and he was released from jail to become President of his country." Mrs. Currie feels a true sense of honor working at the White House. She says, "The best part is playing a role in the day-to-day operations of this Administration and knowing that my service is making a difference. I hope all young Americans will, in some way, aspire to work for their country."